COURTESY: MARY BOONE GALLERY, NEW YORK. Portraits, a new exhibition by New York based painter Eric Fischl, opened at the Mary Boone Gallery in Chelsea this past Saturday. The opening itself was packed with many of the guests admiring themselves as featured in various stages of dress and undress in the bright, sunshine paintings. 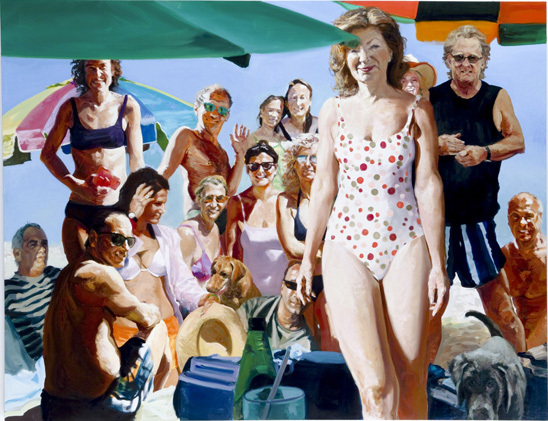 Eric Fischl has always been interested in light and in the visual portrayal of people in his life. Portraits presents several large works of the artists friends as they frolic in places such as the Hamptons and Saint Barts. The paintings have a glossy feel and one can almost smell the wealth of the inhabitants who reside within the crevices of oil paint on linen. They are snap shots that won’t crinkle. Joyous moments that have been frozen in time, and reconfigured within the frame of a stretched canvas. However the most important aspect of Fischl’s work is that they are not photographs but rather gooey oil paintings, and quite painterly at that. In Portraits he’s focused on the brightness of sunshine on the beach, or as it streams through and onto a porch blanching out flesh and turning eyes into thin, squinting slivers. The evidence of human presence is dominating but also what the work is about. The artist strives to capture bodies in space. He immortalizes his friends and canonizes their existence by freezing a memory and then recreating it in a new, foreign context. Have you actually ever been on vacation inside the frame of a painting? It’s the artists prerogative to set the stage and choose his landscape. 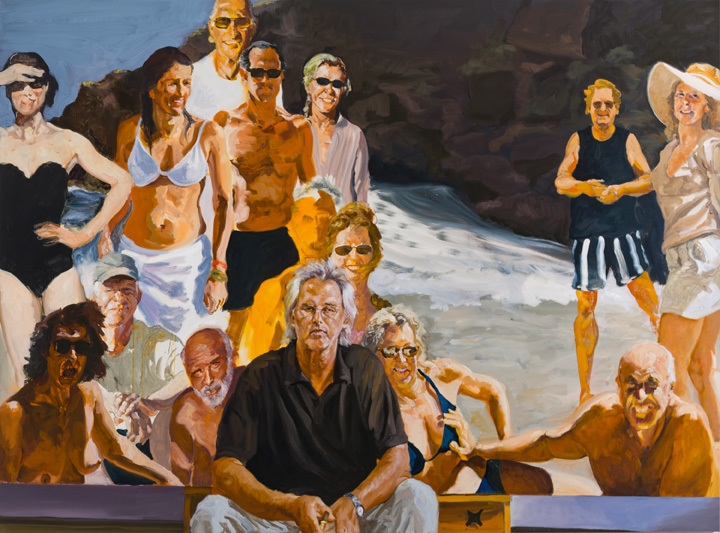 Eric Fischl, “Saint Barts Ralph’s 70th”, 96” x 108”, oil on linen, 2009COPYRIGHT: ERIC FISCHL. Walking through the gallery and peering into the faces of the subjects, certain features can be identified as familiar by way of the celebrity circuit. Actor Steve Martin, who is also a musician, Paul Simon and Francesco Clemente shown with his family (one of the few interiors). One thing I did notice was that the paintings are extremely WASPy. Contextually they focus on what could be a particularly small demographic, but aren’t artists supposed to paint what they know? In an eerie way Fischl offers an uncanny situation turning each viewer into the artist or photographer. The figures gaze out smiling in positions that have been arranged and rearranged, feeling both natural and awkward. Where Fischl shines is when he reminds the viewer that what he/she is looking at is indeed a painting. Subtle marks, strokes and unnaturally lit, white flesh, can be derived from an oversaturated photograph, but the color-blocked markings, when examined closely are juicy areas of shiny oil paint and actually have a tendency to be much more forthcoming than a photograph. A photograph has a predilection for lies, but a painting always represents truth, whether you like it or not. Originally born in New York, 1948, Fischl is currently based in Sag Harbor, Long Island, NY. He has been making figurative, gestural paintings for more than forty years and while some tend to think of his work as stuck in a certain timeframe or dated in a way that in a New York context refers to the 1980’s, figurative painting will never truly go out of style. It will entice the masses and those with an untrained eye but it will also appeal to artworld people and collectors who want to see faces and bodies on their walls. 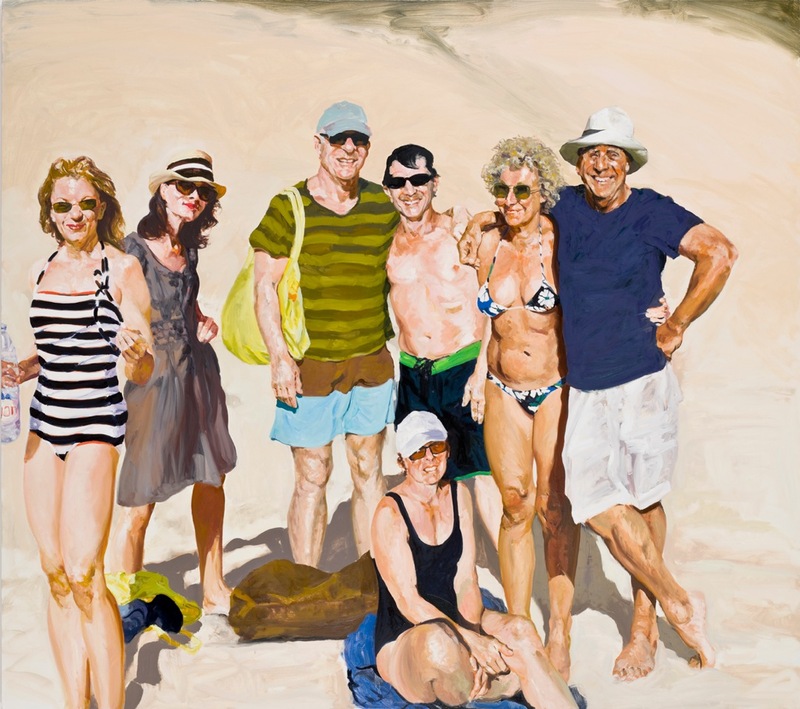 In doing what he does best, Eric Fischl is documenting a part of our society and time. The people in his works are tanned, smiling and approachable yet also oddly detached. They are beautiful but then again, just constructed of pigment. In Portraits, the recent paintings give subtle hints into the year in which they were made and in doing so makes a notation that unlike a snapshot, will not fade away. Eric Fischl: Portraits is on view at Mary Boone Chelsea location, 541 West 24th Street and Midtown, 745 5th Avenue, both in Manhattan. The exhibition will be open to the public until March 17th, 2012.